When the Atlanta Braves selected Derrin Ebert in the 18th round out of Hesperia High School in California, they liked the potential the young lefthander had. Of course, that low in the draft, you are thrilled if they player even sticks around long enough to provide depth to your AAA squad. Ebert did that and eventually became part of an Oscar nominated film. More on that later. Ebert joined the Braves system as a 17-year old kid in the Gulf Coast League. The lanky 6’3″ lefty started seven games in 1994, picking up his first shutout, and posting a 2.93 ERA in 43 innings with a 1.12 WHIP. Expected to have good control, Ebert started a string of great campaigns with a 1.7 BB/9. Rather than play another year of rookie-league ball, the Braves saw enough of the lefty to push him up a level to Macon to open 1995. He was successful in the South Atlantic League, culminating with a 3.31 ERA in a career-high 182 innings. Guess they didn’t care too much about his pitch count back then. Over the next two seasons, Ebert was not quite as good as he was in Macon, but still moved past Durham and Greenville, facing hitters who were often three-to-four years older than he was. While Ebert’s numbers and lack of strikeouts never made him a significant prospect, he was a sleeper with great control who needed that one extra pitch. It never came. Ebert arrived in Richmond in 1998 and for the next three seasons, he would provide the R-Braves innings and not much else. His WHIP for the three years was 1.49, 1.44, and 1.57. He threw at least 150 innings in all three seasons, leading the team once, but despite great control, his K/BB rate dipped under 2 K/BB, which is a disappointing number. Not walking people is fine, but not being able to miss bats leads to a lot of hits. He did break camp with the big league club in 1999, likely because of an injury. He got the call during the second game of the year after the Braves and Greg Maddux had built an 11-1 lead. Ebert gave up five hits and a pair of runs in his three innings, but still picked up a save. To put that into perspective, former Brave Eric O’Flaherty has entered a major league game 373 times and despite a 2.85 ERA, including a 1.99 ERA with the Braves, O’Flaherty has zero saves. But the three-inning save rule has always been kinda weird. Ebert pitched twice more over the next week, but was sent to the minors until the rosters expanded in Stepmber. He pitched twice after that and in eight innings, Ebert had given up nine hits, five runs, walked five, and struck out four while giving up homers to Barry Bonds and Cliff Floyd. His ERA for the season ,and his career, stood at 5.63. 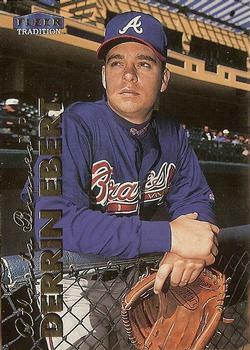 After the Braves outrighted him and he hit free agency after the 2000 season, Ebert got opportunities in seven different organizations, including two stops in Milwaukee, over the span of just four seasons. And that was despite missing the entirety of the 2004 season due to injuries. Ebert, an innings-eater for the Braves, threw over 150 innings just once after the Braves gave him up. After a 2005 season spent mostly at AA for the Royals, Ebert’s career came to a close and he became a pitching coach in Arizona for a traveling team. During this time, Ebert was cast in the film Moneyball as former A’s pitcher Mike Magnante. He got the position after a friend whom he coached Little League Baseball with referred him. Unfortunately for Ebert, his scenes got cut, but he did provide Aaron Sorkin and company input to make the script as natural-looking as possible. Since 2012, Ebert has been a pitching coach for the Reds with their Arizona rookie-league squad and even served an interim pitching coach briefly last year for their AA team.